Recipient of the Angie’s List Super Service Award for 9 consecutive years! Welcome to Budget Basement Waterproofing in Baltimore, MD. Homeowners throughout the state trust us with their homes: their largest investment. That’s because we bring 55 years of experience to waterproofing and water damage situations as a team of licensed and insured professionals who know no equal. 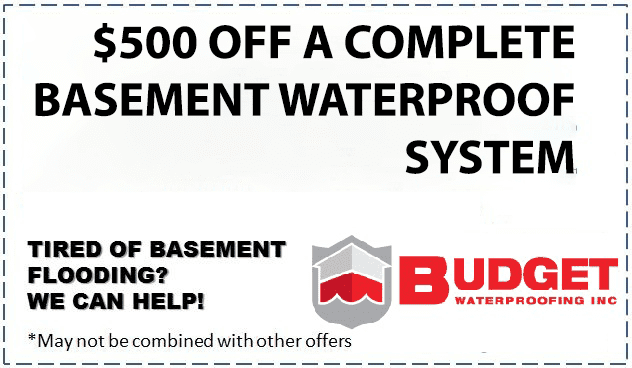 If you have a flooded basement (or want to avoid having to deal with one), call Budget Basement Waterproofing today to inquire about our waterproofing basement services. 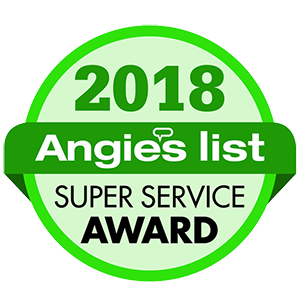 We are proud recipients of the Angie’s List Super Service Award for nine consecutive years! Everything rests upon your home’s basement and foundation, but did you know that most foundations shift and move over the years? When this happens, the surface can separate or crack under tension and allow water to seep in. Of course, builders don’t intentionally design homes that leak water, but structural damage like a shifting foundation makes you and your family vulnerable. When water seeps into the backfill around your home, it can affect your walls and flooring, or cause major flooding where you don’t expect it. New homes, old homes, and expensive homes can all be threatened, so the best preventative measure is to waterproof the basement as soon as possible. Even without a flood, a damp or wet basement is still a problem that warrants attention. Any water content in the air, walls, ceiling, or floor is a haven for mold, mildew, and bacterial infections to grow. Once mold bacteria begin to take hold in a damp basement, they quickly spread throughout both your home and your personal belongings, such as furniture and clothes, causing damage and simultaneously posing a health hazard. At this point, water damage and mold usually require a mold specialist to remove completely. By waterproofing your basement before dampness gets out of hand, you’re taking action to reduce the growth of mold, mildew, and bacterial infection in your home, as well as keeping water out of your basement. Why choose Budget Basement Waterproofing? Few teams in the entire country have our 55 years of experience in the waterproofing industry, watching trends come and go and understanding which methods really stand the test of time. We’re proud to hold an A+ rating with the Better Business Bureau of Maryland and serve as a member of the Maryland Multi-Housing Association. Over the decades, we have built an incredible client base from referrals of satisfied customers who show their trust by giving our name to their family members and friends. Please feel free to contact us today at (410) 609-1240 to schedule an on-site estimate and inspection at your home, or to ask any questions about how we can help protect your property. Budget Waterproofing did a really nice job installing my sump pump and waterjet backup system. Bill came out on time to provide an estimate and took the time to explain everything and answer all my questions thoroughly. The gentlemen who did the work were also on time and were courteous and really cleaned up the area well after the job was done. All in all, I am very satisfied with the service that Budget Waterproofing provided and I would use them again. Highly recommend! We highly recommend Budget Waterproofing, Inc. They identified the problem with water leaking into the basement from groundwater sources and installed the drains and sump pump in a day's work, as promised. We have been amazed at how much water has been pumped, even before we had heavy rains. We no longer worry when we see forecasts for rain! Received a detailed oral and written plan to correct a wet and moldy crawl space. The crew (Mario and Jose) came on time and worked hard and long for 2 days to execute the plan. They dug out the clay inside the poured concrete walls, installed drain pipes, filter cloth and gravel, a sump well and pump, an air ventilation system, patched a cracked wall, and installed a poly liner over the floor. They then cleaned up the basement. We are more than pleased with the work and the people we dealt with. These people care, and they run a business of which they can be proud. Buy with confidence! I had a very positive experience with Budget Waterproofing. The Owner, Bill came out and gave me an estimate of what was needed for my damp / wet crawl space. An appointment was made to do the work. Their crew came on time and were very curtious & polite. They explained what they were going to do. Then went about doing it in a tough environment. They cleaned up after they were finished. Extremely satisfied!